Duke is favored to win the East but at a much steeper price. One would have to bet $175 to win $100 or $17.50 to win $10. The risk vs win ration is much higher. Assuming Duke wins the region, your bet is refunded and the profit is $100 or $10 depending on the bet size. Michigan has the next shortest odds paying $26 for every $10 bet in the East region. Virginia Tech pays out $1300 for every $100 bet. 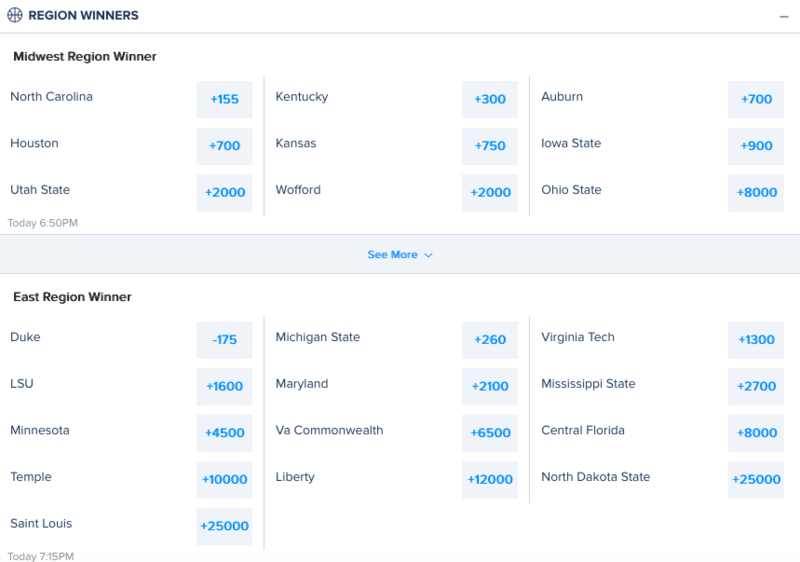 Kentucky pays $30 or $300 in the Midwest followed by Auburn and Houston, each with a payout potential of $700 for every $100 bet.